Gounod’s Mireille is a bit of a rarity and with good reason. 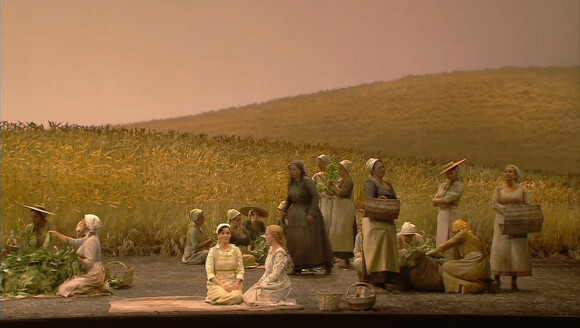 It’s got everything that modern audiences find hard to take in 19th century French opera. It’s revoltingly wholesome with a bit of the supernatural, some patriarchal nastiness and a whole lot of Catholic schmaltz thrown in culminating in a final scene where the dying heroine (of course the heroine dies!) is carried off to heaven by angels while everybody else is suitably pious. It also has some pretty good tunes and a fiendishly difficult soprano lead part. Robert Carsen’s production of Offenbach’s Les Contes d’Hoffmann does a very decent job of presenting this rather muddled and overly long piece. 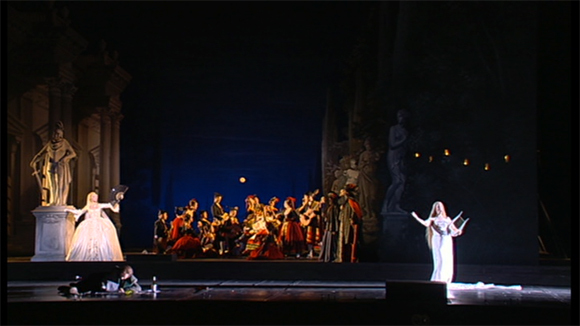 He sets it in and around a production of Don Giovanni in which Hoffmann’s current infatuation, Stella, is singing Donna Anna. There are several quite clever DG references scattered around. By and large it works and is one of the better “theatre in theatre” treatments that I’ve seen. If you have ever wondered why a slapstick comedy is so called then look no further than Gilbert Deflo’s production of Prokofiev’s L’Amour des trois oranges recorded by L’Opéra de Paris in 2005. There’s a great deal of smacking with sticks; most of it by Barry Banks who gleefully whacks just about any bottom, male or female, that comes within range. The production is also slapstick in the generally understood sense of broad physical comedy. There are elements of commedia del arte and lots of circus; jugglers, clowns, fire swallowers, all wrapped up in a sort of 20s vamp aesthetic. It’s wildly chaotic in a rather fun way though it’s all a bit overwhelming and probably worked better in the theatre than on DVD.